Edwin L. Spittler Jr., 57 of 77 Minard Run Road, passed away peacefully, surrounded by his loving family at his home on Wednesday August 8, 2018. He fought a courageous 29 month battle with Multiple Myeloma. Born April 9, 1961 in Bradford, he was a son of the late Edwin L. and Mary R. (Rumsey) Spittler Sr.
Ed was a 1979 graduate of Eisenhower High School and received his Bachelors of Science Degree from Penn State University in 1983. On July 23, 1983 in Warren he married his high school sweetheart Cheryl B. (Johnson) Spittler who survives. Ed was employed as a Personal Account Executive at Sundahl Insurance Company for the last 29 years. He was former member and Past President of the Bradford Community Soccer Club and the Custer City-Rew Baseball League, coaching those sports for over 22 years. Ed impacted so many lives in the community through his many years of volunteer coaching. He was a former member of the Bradford Township Lions Club and the Bradford Chamber of Commerce. 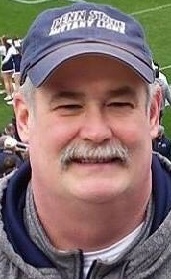 Ed was a devoted husband, father, and grandfather, in addition to his family he was equally passionate about Penn State University sports and his Penn State Alumni Association. Surviving in addition to his wife, Cheryl, of 35 years, are one son, Jacoby (Megan) Spittler of Volant, two daughters, Jenna (Cassidy) Corah of Lewis Run and Abbie Spittler of Bradford, three grandchildren, Jack and Meredith Spittler and Gideon Corah, one sister, Susan Clark of Smethport and one brother, Dana (Teri) Spittler of East Smethport, his uncle, Dr. David Rumsey (Katie) of Smethport, his aunt, Connie Spittler of Bradford, several nieces and nephews and his devoted dog, Zoey. Family will receive friends of Ed’s on Sunday, August 12, 2018, from 2-4pm & 6-8pm in the Hollenbeck-Cahill Funeral Homes Inc. 372 East Main St., where funeral services will be held on Monday at 11:00am with Rev. Max Simms, Pastor of the Hilltop Baptist Church officiating. Burial will be in McKean Memorial Park Cemetery. Memorial contributions, if desired, may be directed to the Leukemia and Lymphoma Society or the charity of the donor’s choice. Cheryl and family: I learned of Ed''s passing from our mutual friend Ken Crosby. To say I was shocked is an understatement. I have so many memories of Ed from our time at Penn State. Hardly a day passes that I don''t have a rememberance of him. You are in my thoughts and prayers. Cheryl, Sue and Dana, My thoughts and prayers are with you and your entire family. I''ve spent the past couple days thinking of our high school years. Ed was a great person and friend, he will be missed by all that had the good fortune to know him. I’m so sorry for your families lost. You all are in my prayers and thoughts. To my very, very special friend, Abbie....my heart is broken for you. Losing your father, especially at such a young age, is extremely difficult. I know he has left you a million wonderful memories....they will help to keep him alive in your ? ?....until you are together again. I know he has been so proud of EVERYTHING you have done so far...and you must continue to make him proud as he will be watching over you constantly. My thoughts and prayers are with you and your family during this difficult time. Your dad was an amazing man! Hugs! ?? you. We are so sorry to hear of Ed''s passing. His dedication to his family and community and his kind and gentle presence will be missed. My thoughts and prayers are with the entire family during this time of great loss for you all. My childhood memories would be incomplete without each and every Spittler kid as they were my ''other'' family. I''m sorry to have lost touch over the years but so grateful for our memories. Our hearts go out to you and your family on the loss of Ed, his father and your father. We hope you have wonderful memories to help you through this very difficult time. Cheryl, my condolences to you and your family. I have many fond memories of Ed during his time at Eisenhower. He was such a kind and caring soul. His smile would light up a room. May God Bless. So sorry to hear this. May you all be blessed. Cheryl, Dana, Sue, my thoughts especially with you. AI have great memories of the whole family. Very sad to lose one of the really nice people of the world. A loving husband and a generous father. A kind, brave soul. It’s a privilege to call him my friend. He shared his family and his home with us for many, many years and we are forever grateful. Ed will be missed so very much. Love and prayers to everyone as we all learn a way of life without him. I''m so sorry to hear of his passing.... what a truly kind man. My family is very sorry for the loss of Ed Jr. and Ed Sr. Praying for your family and friends. I worked with Ed Jr. at the ins. agency a few years ago, he always had a smile on his face and helped me when I needed it. He talked highly of his family. Sending prayers to all. Deepest sympathy. Polly Tyger Dehner and family. We are so sorry for your loss. Ed was such a wonderful man who''s love of community, especially soccer, was endless. He will be dearly missed. I am so sorry for your loss. What a courageous battle Ed fought. He will be missed by many. He touched many lives while coaching youth soccer and made such a difference. I loved his laugh and will miss him. Thinking of you all. Cherish your memories. He will always be you. Cheryl and family, I am so sorry to hear about Ed. Prayers to you and your family.